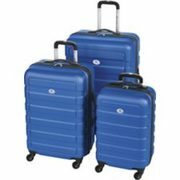 Outbound Hardside Spinner Luggage Set features an impact-resistant construction for long-lasting strength and durability. Four spinner wheels for maximum mobility while navigating through airports and hotels. Push-button telescopic handle allows you to push or pull luggage with ease. Top carry handles for easy lifting in overhead compartments. Tough ABS shell to withstand impacts and drops during transit. Spacious main compartment with 190D lining and convenient pockets. 20" (50.8 cm) piece with a weight of 7 lbs (3.25 kg). 24" (61 cm) piece with a weight of 8.37 lbs (3.8 kg). 28" (71 cm) piece with a weight of 10.8 lbs (4.9 kg). Dimensions without wheels: 28 inch: 28" X 18.5" X 11.5" 24 inch: 24" X 15.3" X 9" 20 inch: 20" X 13" X 8". Dimensions with wheels: 28 inch: 29.5" X 18.5" X 11.5" 24 inch: 25.5" X 15.3" X 9" 20 inch: 21.5" X 13" X 8".